gorgeous pillow! love the pattern. took a little to arrive, but very happy with this purchase. it has nice texture and pattern. I would order again. Global influences: Mix ethnic patterns with Eastern European folk art and the result is a stylish pillow with an eclectic look in gardenia and birch. This pillow is great quality. It's sturdy with more of a rough linen or softer burlap texture, which I love. It might not be the best kind of pillow for napping on, but I love the way it looks and it's plenty supportive for a back pillow, etc. I also love the colors. It goes with everything. I looked at the pillow carefully before ordering and it the background color looked gray . When it arrived it was white, which does not go with my off white sofa. Now I can't send it back, I am stuck with this pillow. Maybe the white color background could be mentioned somewhere to prevent unhappy customers. They were nice pillows but not accurate color. 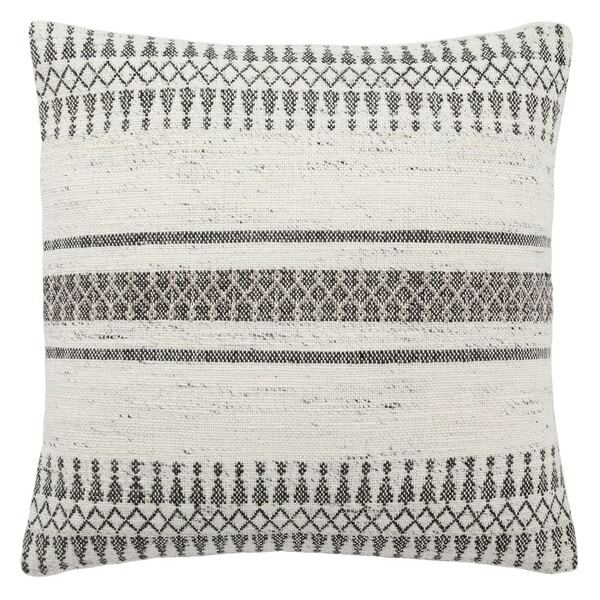 I love this pillow- its got great texture and the colors are right on! Its a nice size and fits great on my sofa. I love the subtle boho design on this pillow it fits perfectly with my current interior design style without being over the top. This is a beautiful, high quality pillow. I ordered this pillow to add some modern flare to my living room. It is just like the picture look with nice and full stuffing. Definitely worth the money! Love these pillows! It looks the same in person as the online photo. Little stiff, but okay with me. Beautiful. Colors match my couch and rug perfect. Great weave and very durable. Great pillow. Sturdy woven fabric with just the right degree of plumpness. Even better in person. Down insert option is great too.